USAF F-4 Phantoms provide close air support (CAS) to US tank columns and troops in Vietnam. The F-4 Phantom II was a twin-engine, all-weather, fighter-bomber that could perform three tactical air roles — air superiority, interdiction and close air support. First flown in May 1958, the Phantom II originally was developed for U.S. Navy fleet defense and entered service in 1961. 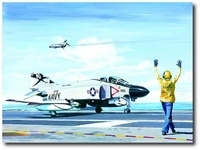 The USAF's Phantom II, designated F-4C, made its first flight on May 27, 1963. In its air-to-ground role the F-4 could carry twice the normal bomb load of a WW II B-17. 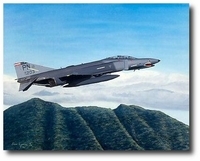 USAF F-4s also flew reconnaissance and "Wild Weasel" anti-aircraft missile suppression missions. 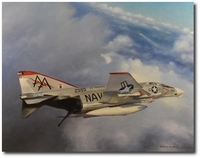 Phantom II production ended in 1979 after over 5,000 had been built--more than 2,600 for the USAF, about 1,200 for the Navy and Marine Corps, and the rest for friendly foreign nations. Used extensively in the Vietnam War, later versions of the aircraft were still active in the U. S. Air Force inventory well into the 1990s. 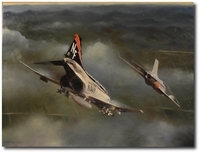 All U.S. F-4s have been retired. 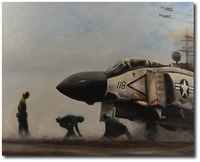 "Phantoms and the Ark Royal"
"The Phantoms and the Wizard"
"21 Seconds to Splash 5"
"USAF Phantoms Supporting the Troops"